Are you looking for an absolutely gorgeous restaurant facility in Roseville where building costs and rents are too prohibitive? Then you must look at this restaurant. The rent is only $1.79 Sq. Ft. 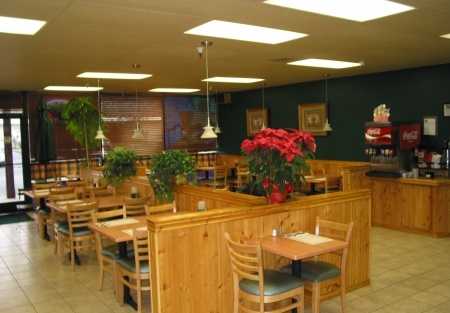 The restaurant is only a few years old and in excellent condition. There is over 100 parking spaces and 2,040 sq. ft of interior space. This restaurant has developed a reputation and was voted top three best salads in the annual Roseville Granite Bay Style Magazine, and was featured in Roseville Style Magazine. This is a great location screaming for a great concept to attract customers. This is a sharp restaurant with a clean-cut look, modern Italian lighting and contemporary tables and chairs. There is also a counter with an ice cream display freezer and an espresso machine directly across the counter. The kitchen is highly versatile with its 17 foot hood, fryer, oven, stove, two grills, walk-in cooler, walk-in freezer, and much much more. The current menu offers a Mediterranean experience, however conversion to your own concept would leave multiple possibilities. Why spend $400,000 or more on an expensive build out when the work has already been done for you. Take the next step and complete the online confidentiality agreement and you�ll be provided with the restaurant name and address. Also you will given priority notification to new listings in the future, prior to the general public, giving you the best chance to �scoop in� the best opportunities. There are also more photos available to our registered buyers. This is a Paramount Restaurant Brokers, Inc. DBA SellingRestaurants.com listing. Own a restaurant near the busiest street in Roseville for only $1.79 a sq. foot.